Can You Drink a Protein Shake Before Doing Cardio? Protein is one of the key macronutrients your body needs for cell and tissue growth, including the growth of muscle tissue. Protein in itself is not absorbed by the body; it is digested by the body and converted to usable amino acids, which are the building blocks of proteins. The human body can only absorb so much protein per day. Consuming beyond this limit can lead to negative health effects. 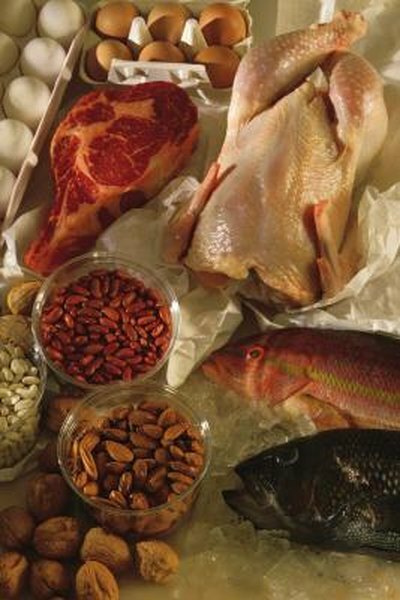 The two types of dietary proteins include complete and incomplete proteins. Complete proteins, also referred to as high-quality proteins, come from animal products. Complete proteins contain all of the essential amino acids your body needs but can’t produce itself. Source of high-quality protein includes meat, fish, eggs and dairy products. Incomplete proteins contain fewer than all of the essential amino acids. Food sources of incomplete proteins include rice, beans and corn. Different types of proteins absorb at various rates. For instance, whey protein – derived from milk – absorbs relatively quickly compared to protein from eggs or vegetables. Eating more protein each day than is needed does not benefit health or improve lean body mass. Balanced nutrition helps reduce the risk of chronic disease. Increasing one food type -- carbohydrates, protein or fats -- can cause nutritional imbalances. According to Sheri Barke, M.P.H., R.D., nutrition coach at College of the Canyons, Student Health and Wellness Center, carbohydrates supply fuel for your muscles. Excess protein intake can lead to inadequate carbohydrate consumption and decrease stamina needed for exercise. If you are dieting and want to increase lean muscle mass, you need carbohydrate energy for your workouts. The Institute of Medicine recommends that adult women consume 46 grams of protein per day or 10 to 35 percent of daily calories. For a more individualized estimate of adult protein needs, which varies according to body weight and activity level, the IOM provides this formula: 0.8 grams of protein per kilogram of body weight. To get your weight in kilograms, divide pounds by 2.2. Example -- if you weigh 120 pounds, divide your weight by 2.2 = 54 kilograms. Next, multiply 54 kilograms x 0.8 = 43 grams of protein needed to meet your daily requirement. Harvard University Health Services recommends 1.2 to 1.4 grams of protein per kilogram of body weight for endurance athletes and 1.6 to 1.7 grams/kilogram if you regularly perform strength-training exercises. The by-products, or waste products, of protein digestion include urea, ammonia and uric acid. When you consume excess protein, your kidneys must work harder to excrete the excess waste products. Excess urea can cause kidneys to fail, according to Barke. Because you body uses extra water to excrete excess urea, you can become dehydrated. Excess protein may cause your bones lose calcium, which is needed as a buffer for acid produced from excess protein intake. Can Diet Increase Albumin Levels? How Much Protein Should You Have Pre-Workout? Which Do You Burn First, Carbohydrates or Fat?